The common Angelica has the botanical name of Angelica archangelica. It is grown as an ornamental, culinary and medicinal plant. This is an easy to grow plant, tall and with attractive yellow flowers in late summer. Traditional used in jams and jellies, the stems were once popular for cake decoration. The leaves are used to make a tea and the root is said to have medicinal uses. This tall growing perennial also looks great when used as an ornamental plant in the border. It provides height, is foliage is aromatic, and a rather stately plant. All Varieties can be grown from seed and propagation is not difficult, although seeds are hard to find and germination rates are low. The older the seed, to less likely they will be viable. It is best to give the seeds a cold stratification before sowing. Place the seeds in with peat moss or vermiculate in a zip lock bag and keep in the refrigerator at night for 3 – 4 weeks, remove them during the day. This gives them a cold night and cool day, just what they need to break the dormancy period. The seeds should then be sown into individual pots, sow them on the surface and cover lightly with a thin layer of vermiculate. For best results use a heated propagating tray to complete the germination process. This will provide warmth for the root system. Mist spray to maintain moisture and humidity. Once the seed germinate, and reach a good size you can plant them out into the garden or container. When planting out remember that these are a tall growing plant, reaching to around 1.5 – 2m in height and preferring a moist humus rich soil. Best in a part shaded position, these are not difficult plants to grow once established. The root from the plant A. polymorpha is used widely in herbal medicines as well as in cooking. A. pachycarpa is from New Zealand, glossy foliage and white flowers. Strictly an ornamental plant it does require a moist soil. A. sylvestris is commonly called ‘Vicars Mead’, dark flowers make it attractive when in flower. Angelica root is used for flavouring Chartreuse. 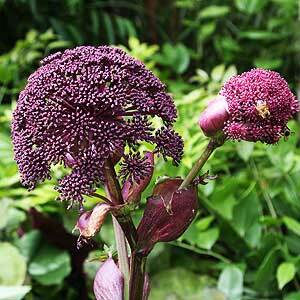 A. archangelica is the common Angelica used in cooking, but there are over 50 over species. All species can be grown from tubestock or from seeds. In the garden border, plants such as A.gigas are grown for the foliage as well as the large flower heads, depending on the species.